Get a good look at Google Maps now, because it may soon start filling up with lots of company logos. Among a number of announcements coming out of Google’s Performance Summit, the company has announced it is bringing what it calls more “branded and customized experiences” for marketers to Google Maps. 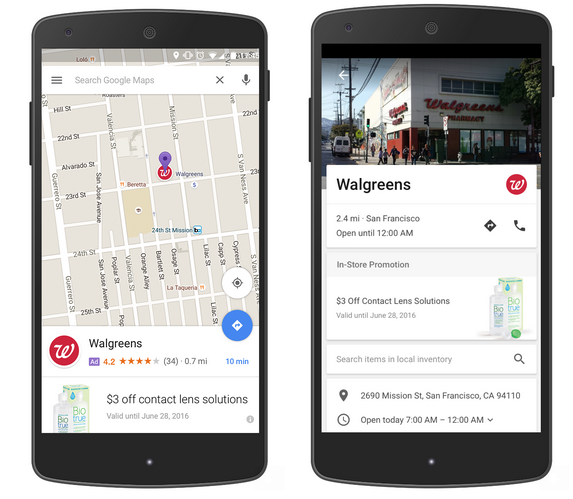 Not only did Google recently begin showing ads in the Local Finder, they will now be introducing “promoted pins” or “promoted locations” on Maps giving users the ability to view branded pins alongside or nearby their route. Promoted pins are companies that have paid for their logo to appear in your map. Logos could appear as you look at a map, or show up in your driving route. For example, the logo for Starbucks might appear as you follow on-screen map directions. With the upcoming changes, you may find coupons or even browse inventory when you tap on a logo that prompts the business page to open at the bottom of your screen. Only time will tell what this means for small businesses that can’t out-advertise the larger brands, however it’s natural that Google would want to offer advertisers a more prominent spot in Google Maps. Google is, after all, still a company that makes money by selling ads.